Lynch is poised to succeed Eric Holder. 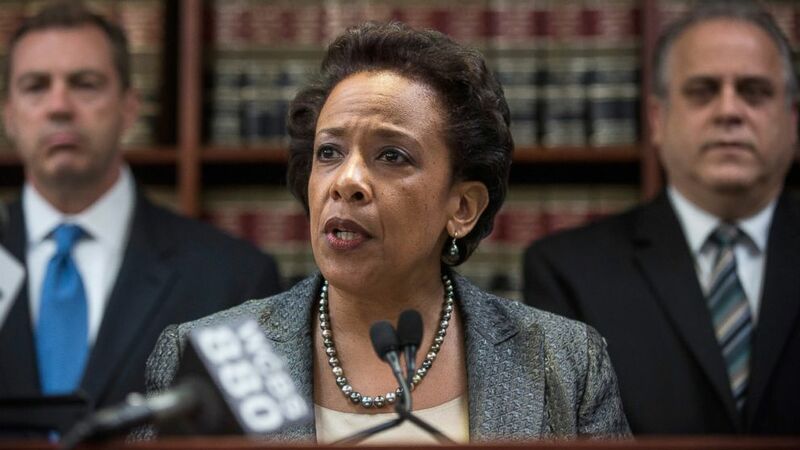 camera (Andrew Burton/Getty Images) Loretta Lynch, United States Attorney for the Eastern District of New York, speaks at a press conference, April 28, 2014, in New York City. President Obama will nominate Loretta Lynch, currently the U.S. Attorney for the Eastern District of New York, to succeed Eric Holder as the next U.S. Attorney General, ABC has learned. If confirmed, Lynch would become the first African-American woman to lead the Justice Department. Appointed U.S. Attorney by President Clinton in 1999 and again by President Obama in 2010, Lynch would bring a wealth of expertise to the DOJ -- the Harvard-educated lawyer also served as a member of the board of the Federal Reserve Bank of New York and was a litigation partner at Hogan & Hartson L.L.P. Even so, Lynch is an unconventional choice for the Obama administration – she is not part of the president’s inner circle and remains doggedly low-profile. But her distance from Obama could give her an edge during her confirmation hearings, allowing her to avoid defending administration policies in the new Republican-controlled Senate. Lynch was a member of the trial team that convicted several NYPD officers involved in the torture of Haitian immigrant Abner Louima in August 1997. After repeatedly pummeling him with their nightsticks, uniformed officers arrested Louima outside a Brooklyn-area nightclub for allegedly interfering with their efforts to break up a fight between two women there. The officers then brought him back to the police station, where he was dragged, handcuffed, into a filthy bathroom and violently sodomized with a broken broomstick. Much like the Ferguson incident that roiled racial tensions around the nation this summer, the Louima beating was said to exemplify a pattern of law enforcement harassment of young black men. Lynch also prosecuted a string of accused terrorists, including Quazi Mohammad Rezwanul Ahsan Nafis, a Bangladeshi man convicted in a sting operation of attempting to blow up the Federal Reserve Bank of New York in October 2012. He and a man he believed to be an Al Qaeda operative – actually an undercover federal agent – worked together to construct a 1,000 pound “bomb” out of garbage bins and batteries, which Nafis loaded into a van and parked outside the Federal Reserve building. When Nafis attempted to detonate the device remotely, police arrested him. “The prospect of widespread death and destruction could not dissuade him from his deadly plan. Nafis’ goals of martyrdom and carnage were thwarted by the vigilance of law enforcement,” Lynch said in a statement. Nafis eventually pled guilty to attempting to use a weapon of mass destruction and was sentenced to 30 years in prison. In June 2013, Lynch announced a major immigration bust at more than a dozen 7-Eleven stores in New York and Virginia. Store franchisees, prosecutors said, were running a “modern-day plantation system,” providing undocumented immigrations with stolen identities, then housing them in cramped boarding houses, forcing them to work 100-hour weeks, and confiscating up to 75 percent of their pay. The store franchisees and operators eventual pled guilty to committing wire fraud and harboring illegal aliens. Lynch’s office handled the prosecution of so-called “pot mom” Andrea Sanderlin, a wealthy suburban woman who in June 2013 was accused of running a $3 million, 1,000-plant marijuana operation she called “Fantastic Enterprises” out of a warehouse in Queens. Sanderlin pled guilty to drug charges and was ordered to fork over $1 million as part of a plea deal. Lynch also led the investigation of Republican Rep. Michael Grimm, NY, who was indicted in April on 20 counts ranging from tax fraud to perjury to obstruction of justice. According to the indictment, Grimm, an FBI agent-turned-restaurateur, allegedly paid his staff under the table and concealed more than $1 million in gross receipts from the IRS. But Grimm, who was reelected to the House on November 4th, has blasted the indictment as a “political witch hunt” and maintains innocence. The case is set for trial on Dec. 1. ABC’s Jeff Zeleny and Devin Dwyer contributed to this report.